There aren’t many places, especially in major college football and basketball, where women’s programs get the same attention and exposure as men’s. 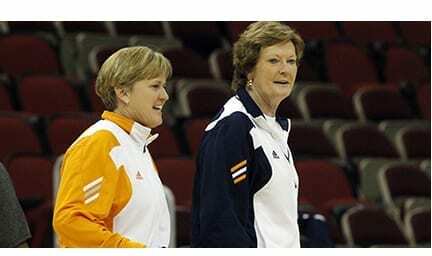 But at Tennessee the Lady Vols have been in the spotlight for decades, thanks to the exploits of the late Pat Summit. Few would even dare follow someone as prolific or successful as Summit, but one person who was certainly qualified to do so was Holly Warlick. Warlick was an All-American guard on Summit title teams. She served on her staff for 27 years, seven as an associate head coach. As a player she was good enough to have her number retired. As a coach she was a personal Summit favorite, and at first glance her record is far from awful. It just wasn’t close to matching her predecessor’s exploits, something no one could do. Warlick coached seven years at UT, winning 172 games and losing 67. The Lady Vols reached the Elite Eight three times and made the NCAAs each season. But the grumbling had begun in earnest the last couple of years, and this past season sealed Warlick’s fate. Tennessee finished 19-13, missing the 20 victory mark for the first time since 1975-76. They lost at home to a Vanderbilt team that at the time had one SEC win. They were eliminated in the first round of the NCAAs. Last Wednesday athletic director Phil Fulmer ended Warlick’s longtime association with the Lady Vols program. Fulmer praised her dedication and years of service to the school, but said he was making the move in “the best interests of the program.” The recruiting class she had lined up was ranked number nine in recruiting services. Praise for Warlick and condemnation of the move came from many places, with UConn head coach and longtime UT rival Geno Auriemma saying he wondered who “impatient” UT fans would want for a new coach. The Warlick firing is another signal that winning period is the bottom line for top major college programs. It doesn’t matter how loyal you are or how long you’ve been there, or whether your players are academically succeeding. If you don’t win, you are out. Holly Warlick knew better than anyone the immense challenge following a legend posed. She did an admirable job for many years. It will be quite interesting to see if her successor fares any better, and how much time that person gets before the inevitable comparisons are made between them and the irreplaceable Pat Summit. Next articleWhat is a Tongue Scraper?